And those words came to me: the poor, the poor. Then, right away, thinking of the poor, I thought of Francis of Assisi.... He is the man who gives us this spirit of peace, the poor man.... How I would like a church that is poor and for the poor! A church that is poor and for the poor—these words evoke the simplicity of the Poverello, the radical detachment of St. Ignatius, and echo the Magnificat. But beyond their lyricism and beauty, what, exactly, do these words mean? We can identify two ways that the church is for the poor. The first is that the church seeks to provide for the needs of the materially and spiritually poor. We typically associate this first way of being for the poor with works of mercy. The 25th chapter of Matthew’s Gospel sets forth our obligations to the “least of these”: feed the hungry, give drink to the thirsty, welcome the stranger, clothe the naked, care for the sick, visit the imprisoned. The church traditionally adds a seventh, bury the dead. There are also, of course, the spiritual works of mercy: instruct the ignorant, counsel the doubtful, admonish sinners, suffer wrongs with patience, forgive willingly, comfort the afflicted and pray for the living and dead. These are concrete ways in which the church can be for the poor, providing material and spiritual goods that are otherwise lacking. Now the body of Christ, the church, does all these things and more, even if individual members do not. If the Gospel is to be believed, we will be judged on our care for the “least of these.” And it is this reality—that we stand under God’s judgment—that underscores the ultimate inadequacy of our own works of mercy. The only mercy we can offer the world, or one another, is temporary and incomplete. Our mercy, without God’s mercy, is vain. This brings us to the second way in which the church is for the poor: the church is for the poor in that we, the members of the body of Christ, are all afflicted by sin and the poverty of our fallen condition. God’s perfect response to our most profound poverty is his mercy, and the Catholic Church, founded by Jesus Christ, is the privileged conduit of that mercy—the very sacrament of our salvation. God forgives sins. He saves. He grants eternal life. Whatever temporary good we may accomplish by our own works of mercy, they can never replace that divine mercy, but instead serve as its heralds. That is not to denigrate our works of mercy but to insist on their inadequacy to the poverty of sin. When our labors on behalf of the poor—our works of mercy—are cut off from the proclamation of the One Who Saves, our work remains sterile, merely human. In his first homily as pope, Francis made this point in the starkest terms: “We can walk as much as we want, we can build many things, but if we do not profess Jesus Christ, things go wrong. We may become a charitable N.G.O., but not the church, the bride of the Lord." The point is that a church that is truly for the poor must concern itself with temporal needs but must also offer something eternal that exceeds the limits of mere human agency. The church is for the poor in the most profound sense when it acts as a channel for God’s saving grace and becomes an instrument of his mercy. This is why, in Catholic social teaching, the preferential option for the poor is to be understood primarily in terms of the saving action of Christ in and through his church. For the church, the option for the poor is primarily a theological category rather than a cultural, sociological, political or philosophical one. God shows the poor “his first mercy.”... This option—as Benedict XVI has taught—“is implicit in our Christian faith in a God who became poor for us, so as to enrich us with his poverty” (No. 198). But when the kindness and generous love of God our savior appeared, not because of any righteous deeds we had done but because of his mercy, he saved us through the bath of rebirth and renewal by the holy Spirit, whom he richly poured out on us through Jesus Christ our savior, so that we might be justified by his grace and become heirs in hope of eternal life (Ti 3:4-7). God chose to open the font of his divine mercy in the most acute moment of his own poverty upon the cross. So a “church for the poor” directs us to the work of mercy, which points ultimately to God’s mercy, by way of his chosen poverty. And this is where we come to see fully what Pope Francis means by “a church that is poor.” Following Christ’s example, a church that is for the poor in the way Christ is for the poor must, in some important sense, also be poor itself. If Christ identifies himself with the poor in a special way—“Whatever you did for one of these least brothers of mine, you did for me”—and became poor himself, how can the church, the body of Christ, do otherwise? In our society, we conceive of our obligation to the poor almost exclusively as a function of distribution, of moving goods from those who have to those who have not. The upshot is that our discussions of poverty tend to be overtly materialistic, focusing on the efficiency and efficacy of public versus private means of redistribution, the comparative importance of economic growth versus economic stability and so on. Such questions are far from unimportant, but they touch on only one dimension (not the most important dimension) of the church’s option for the poor. Such a truncated view of things can lead us to confuse justice and charity (by treating as charity what are, in fact, matters of “mere” justice) while simultaneously obscuring the truth that love finds its fullest expression in mutuality and reciprocation. So while our affluent society finds it comparatively easy to think about distributing goods to the poor, it never seems to occur to most of us that we might view the poor as more than receptacles for our beneficence, still less that those poorer than ourselves might possess something that we lack and need. Rather than take the risk of being receptive and vulnerable to them, we allow them to remain strangers, alienated and excluded. How different from the example Christ gives! We see this most dramatically in his Passion. The word itself—passion—points to an “undergoing.” He endures pain and suffers death for our sake. But even before his final suffering, he “undergoes” and “endures”—he suffers—our very humanity by taking it upon himself in the Incarnation. God, who is the fullness of being, lacking in nothing, takes on our nature and opens himself to receive our love—not as a master receiving the obeisance of a slave but as father receiving his son and as brother receiving brother. God became poor so that we, who are infinitely beneath him, could love him like family; dare I say it, like equals. He submits himself to our friendship; he suffers us to love him. How shocking—almost blasphemous—that God permits us to love him this way! God became poor to enrich us by his poverty. The option for the poor, then, arises from the very heart of the mission of the church because it is central to the saving mission of Christ. In his love and mercy he treats us, lowly sinners that we are, as though we have something to offer him. He loves us and lets us love him. When we approach the poor and suffering with this same humility, we discover a privileged place of encounter with Christ, who is already there amongst his beloved poor who know and experience his suffering in a special way. This is why I want a church that is poor and for the poor. They have much to teach us. Not only do they share in the sensus fidei, but in their difficulties they know the suffering Christ. We need to let ourselves be evangelized by them. The new evangelization is an invitation to acknowledge the saving power at work in their lives and to put them at the center of the church’s pilgrim way. We are called to find Christ in them, to lend our voice to their causes, but also to be their friends, to listen to them, to speak for them and to embrace the mysterious wisdom which God wishes to share with us through them. A church that is for the poor loves the poor and shows them mercy in body and soul. A church that is poor is humble before the poor and suffering, and so imitates Christ, who in his mercy opens himself to love and be loved even by sinners. A church that is poor and for the poor is a church that knows the depths of the mercy of God and so understands that ignorance of the poor is ignorance of Christ. The Catholic Church, it bears repeating, is just such a church. 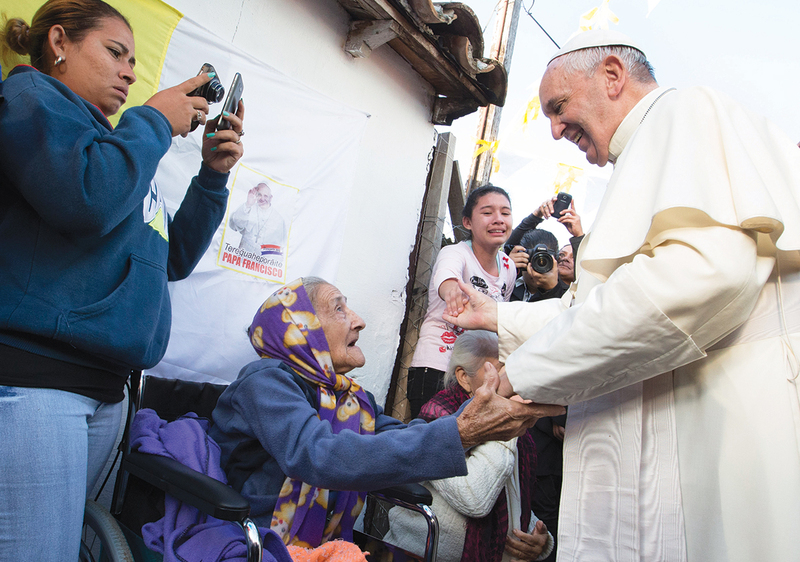 Pope Francis’ wish is that it become ever more so, which is a great challenge to all of us who stand in need of God’s mercy: “For you know the gracious act of our Lord Jesus Christ, that for your sake he became poor although he was rich, so that by his poverty you might become rich” (2 Cor 8:9). “A church that is poor is humble before the poor and suffering, and so imitates Christ, who in his mercy opens himself to love and be loved even by sinners. The Catholic Church, it bears repeating, is just such a church.” I struggle with that notion when I see pictures of Archbishop Ray Burke in his array of finery, when I read of Archbishop Charles Chaput demanding obeisance from those parents who choose to enroll their children in catholic schools. I struggle with that of a church that fires long-germ employees simply because they admit they are gay or lesbian. I struggle with that knowing that many American bishops live in mansions and are drive in luxurious cars. And I struggle with that notion when we spend money on renovating diocesan cathedrals that almost no one visits and cannot fund social justice activities. I struggle with that notion when dioceses abandon adoption and foster care agencies in order to avoid placing homeless children with same-gender couples. We are a good community, but we have a long way to go to become a “poor church” as Francs seems to envision it, at least in the United States. This article also appeared in print, under the headline "They Know the Suffering Christ," in the September 21, 2015 issue. Stephen P. White is a fellow in Catholic Studies at the Ethics and Public Policy Center in Washington, D.C., and coordinator of the Tertio Millennio Seminar on the Free Society.